The Mongolian language ( , Mongɣol kele, Cyrillic: Монгол хэл, Mongol khel) is the best-known member of the Mongolic language family and the language of most of the residents of Mongolia, where it is officially written with the Cyrillic alphabet and of around three million Mongolian speakers in the Inner Mongolia Autonomous Region of China, where it is officially written with the traditional Mongolian script. 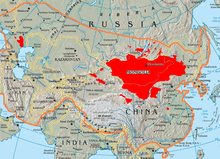 It is also spoken in some areas in the Russian Far East and Kyrgyzstan. The majority of speakers in Mongolia speak the Khalkha (or Halh) dialect, while those in China speak one of many Inner Mongolian dialects. ↑ Hammarström, Harald; Forkel, Robert; Haspelmath, Martin, eds. (2017). "Mongolian". Glottolog 3.0. Jena, Germany: Max Planck Institute for the Science of Human History. This page was last changed on 17 August 2018, at 17:58.